How can we "see" the layers of the Earth? A CAT (computed axial tomography) scan animation is included because seismic tomography is often compared to CAT scans. Both techniques have an energy source (seismic tomography uses the energy generated from earthquakes; CAT scans use x-ray energy) and a receiver (seismic tomography uses seismograph stations; CAT scans use comtuters) that records the data. In this animation we simplify things and make an Earth of uniform density (isotropic; constant velocity sphere) with a slow zone that we image as a magma chamber for simplicity. For reference, the Earth figures below show the difference between our simple animation and a body with changes in rock type and temperature that cause the seismic waves to refract and bend when transmitted between different rock compositions. 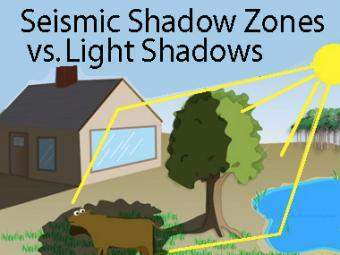 Seismic shadow zones have taught us much about the inside of the earth. 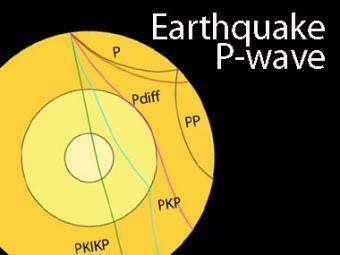 This shows how P waves travel through solids and liquids, but S waves are stopped by the liquid outer core. The wave properties of light are used as an analogy to help us understand seismic-wave behavior. 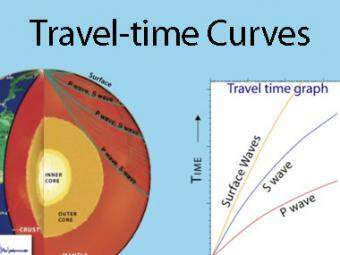 A travel time curve is a graph of the time that it takes for seismic waves to travel from the epicenter of an earthquake to the hundreds of seismograph stations around the world. The arrival times of P, S, and surface waves are shown to be predictable. This animates an IRIS poster linked with the animation. 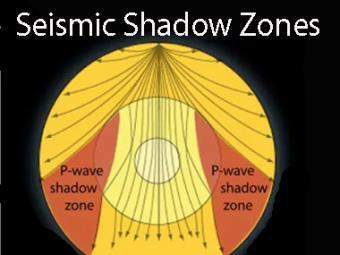 The shadow zone is the area of the earth from angular distances of 104 to 140 degrees from a given earthquake that does not receive any direct P waves. The different phases show how the initial P wave changes when encountering boundaries in the Earth. 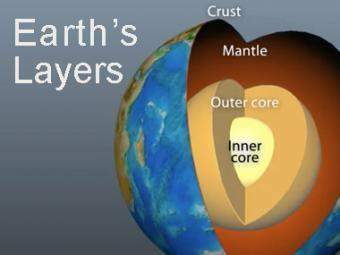 The Earth has 3 main layers based on chemical composition: crust, mantle, and core. Other layers are defined by physical characteristics due to pressure and temperature changes. This animation tells how the layers were discovered, what the layers are, and a bit about how the crust differs from the tectonic (lithospheric) plates, a distinction confused by many. 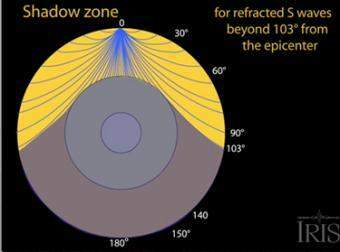 The shadow zone results from S waves being stopped entirely by the liquid core. Three different S-wave phases show how the initial S wave is stopped (damped), or how it changes when encountering boundaries in the Earth. 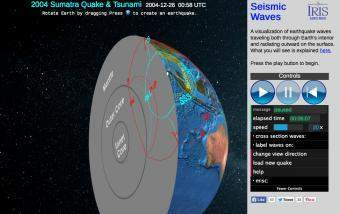 Earthquakes create seismic waves that travel through the Earth. 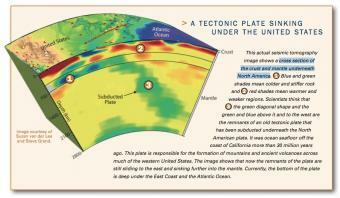 By analyzing these seismic waves, seismologists can explore the Earth's deep interior. 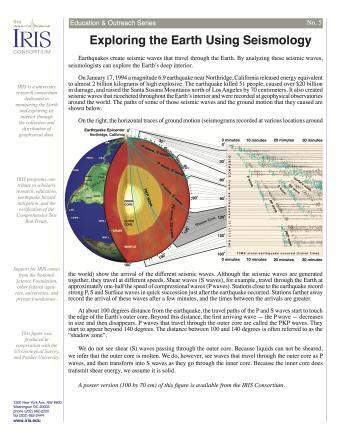 This fact sheet uses data from the 1994 magnitude 6.9 earthquake near Northridge, California to illustrate both this process and Earth's interior structure. 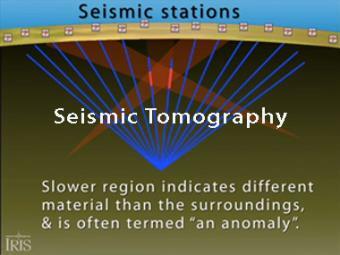 Introductory description of how seismic tomography is used to determine Earth structure. Learning occurs as students work first in small groups and then as a whole class to compare predicted seismic wave travel times, generated by students from a scaled Earth model, to observed seismic data from a recent earthquakes. This activity uses models, real data and emphasizes the process of science. 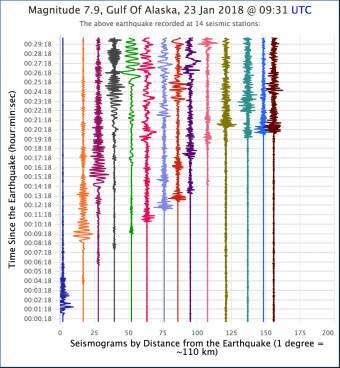 Easily view seismograms from stations around the world for large earthquakes. 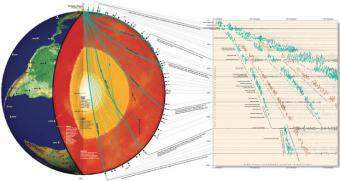 Plots can be used for a variety of activities including to determine the diameter of Earth’s outer core as part of a classroom exercise. Seismic Waves is a browser-based tool to visualize the propagation of seismic waves from historic earthquakes through Earth’s interior and around its surface. Easy-to-use controls speed-up, slow-down, or reverse the wave propagation. 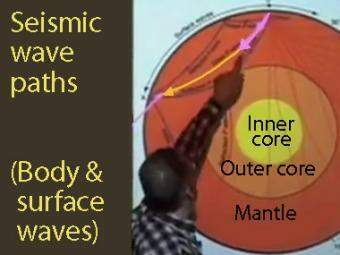 By carefully examining these seismic wave fronts and their propagation, the Seismic Waves tool illustrates how earthquakes can provide evidence that allows us to infer Earth’s interior structure.